You may have seen election results maps from the presidential election showing that we don’t live in a “red vs. blue” country so much as a “Purple America”. The same is true in Rhode Island, but from mainstream coverage in the days following last month’s Presidential Election you wouldn’t know it. The Providence Journal published a map a few days after the election titled “The two Rhode Islands: blue state, red state“. It heavily featured the map at right. While this map is nominally accurate, the state doesn’t operate the same as the national Electoral College, where the winner is determined by who wins each internal jurisdiction. 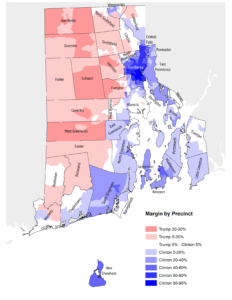 Instead, Rhode Island’s election victor is determined essentially by a popular vote, agnostic of city and town boundaries. Classifying towns as simplistically red or blue is a deceptive use of data. News organizations should make an effort to avoid divisively and arbitrarily misconstruing the data in this way. 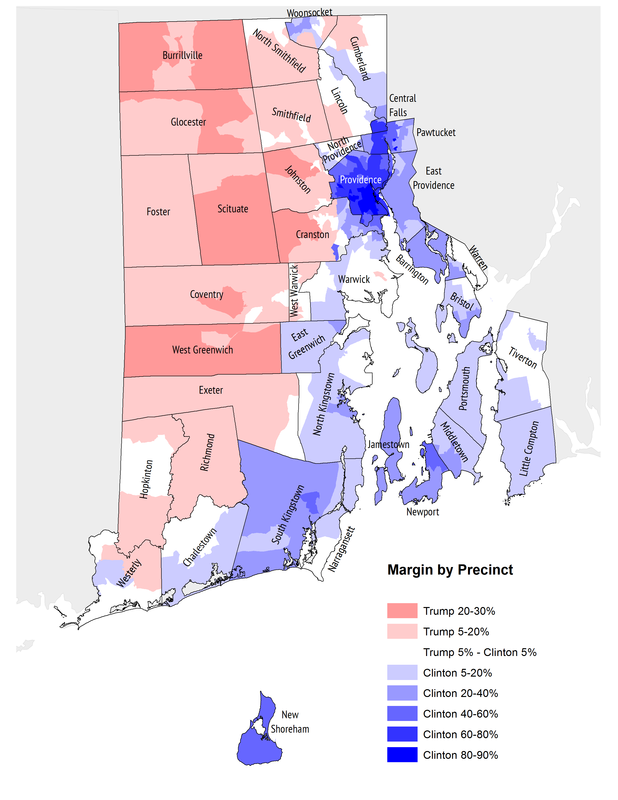 The margins by which Clinton won the urban core of Rhode Island completely dwarf the margins by which Trump won anywhere in the state. Even in West Greenwich, Scituate, and Burrillville precincts, no less than 35% of people voted for Clinton. The interesting pattern of precincts next to the water (or next to the Blackstone River) going more for Clinton holds true. There are surprisingly few precincts that were close (white in my map). Mostly in Warwick, Lincoln, and Tiverton. I am proud to live in Providence, which not only voted overwhelmingly for Clinton but which has also been leading the resistance to his intedned appointment of ultra-conservatives and corporate executives. I’m also proud to live in a state that has blue areas and red areas close by, because talking to each other and pursuing the wellbeing of everybody is a big part of how we must move forward as a society. RIPTA starts pushing real-time data to Transit App!